When I saw the Black Widow Holster Bag on ThinkGeek I said, “Oooooooh!” out loud. I’m a sucker for accessories and clothing that you can fit into your everyday life and make you feel like you’re part of a movie. Black Widow is definitely one of my favorite Avengers too. So this bag already had several points going for it. It seemed like a good bag for non-costume days at conventions and bolder evenings and weekends in day-to-day life. This black faux leather bag is made to sit on your right hip. It does not look like it’d be easy to switch it to your left if you’re left-handed (if it’s even possible). The waist and thigh straps are made of webbing and are very easy to adjust. There’s a helpful loop on the thigh strap to slide near the end of the webbing so any extra you have isn’t smacking your legs as you walk. A small side release buckle serves as the closure for that strap too. Closing that buckle can get awkward based on the length to which you have the strap adjusted. It was a little difficult for me. 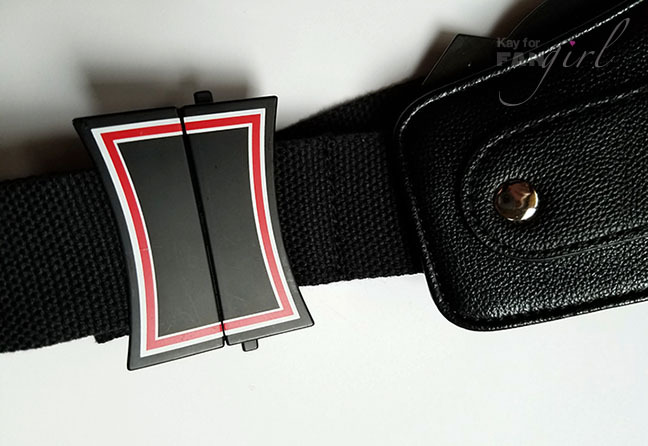 The waist belt is closed with a cool Black Widow logo buckle. Since it is metal, it looks like you may have to be careful not to scratch any of the paint off. Adjusting the waist belt had a minor hiccup in that I ended up with extra webbing that went past the bag and it wasn’t easy to cleanly tuck it in. Black Widow needs clean lines, don’t you know. 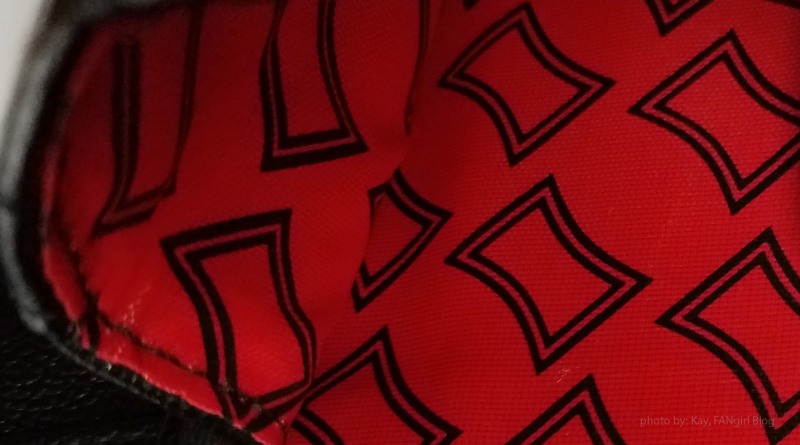 Inside the bag itself is red and black Black Widow logo lining that makes it easier to see the contents you’re toting. 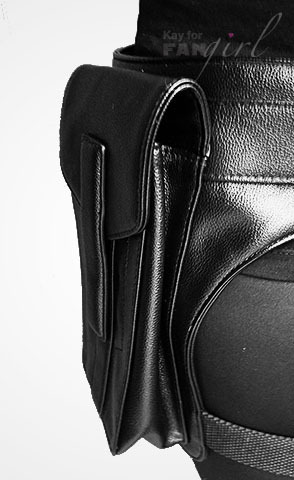 A magnetic bag closure means you don’t have to worry about any precision in snapping against your leg. Merely let go of the bag’s flap and when it gets close enough, it connects. This is convenient for opening and closing your bag quickly, but it’s not as secure. The flap is large enough that you might notice if someone else was opening it, but not necessarily. Stitching on the bag was nicely done and the PU materials aren’t too shiny – although there is a definite contrast in person between the PU and the matte webbing. 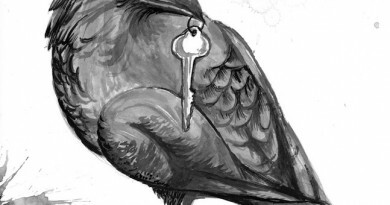 I guess that has an element of practicality to it, but I went back and forth over whether I liked the overall look. What really got to me though was the size of the bag. I probably should have measured out its dimensions before ordering, but ThinkGeek’s description made it seem like I’d be able to carry a fair amount. I was only able to fit my wallet and phone in there. A pen might have fit too. I was hesitant to even try putting my keys in, in case they scratched up the other contents as I walked. The good news is once you’re all adjusted, buckled in, and safely stowed your items in the pocket on your hip, it’s actually really comfortable to wear walking around. The straps stay in place very well and the whole contraption only weighs around 1 lb before you put anything in it. 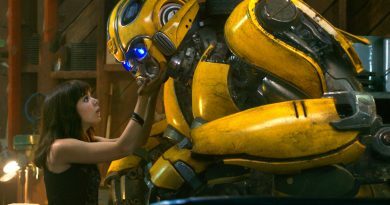 So what’s my final assessment? Ultimately I decided it just wasn’t practical enough to keep, so back it went. 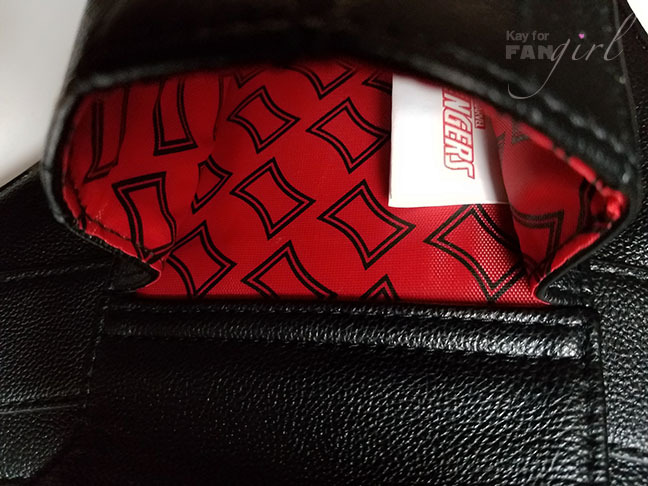 It is a fun product though and comfy to boot, so if you can look past the cons, I suggest giving the Marvel Black Widow Holster Bag at ThinkGeek a go. This bag retails for $29.99 and is exclusive to ThinkGeek. 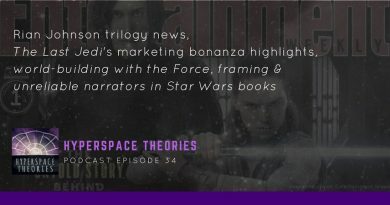 Hyperspace Theories Episode 34: The Last Jedi Approaches!